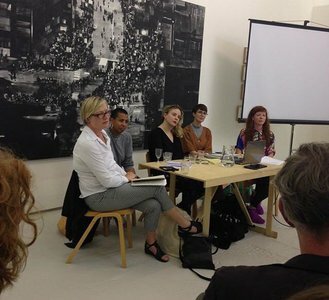 On the occasion of Heather Phiillipson's 'Annotation's residency at The Drawing Room, Helena Reckitt chaired an evening of readings, presentations and discussions. Joining Heather Phillipson were invited friends: Helen Cammock, artist; Karen Di Franco, archivist and curator; and Helen Nisbet, Curatorial Fellow, Cubitt. Contributors considered intersections of drawn and written lines – the potential convergences for visual and poetic practices in attempting to, as Kathy Acker said, ‘mine the hot stuff’.